Terry took time out from a busy book tour to chat with us about Tanequil: High Druid of Shannara. Terry is a perennial favorite not only of our show but fantasy writers everywhere. In this conversation we talk not only about the book, but also Terry's life as a writer, how he approaches the craft and how writing fantasy for a living has influenced his life. And can you believe it's been 35 years Terry's been writing in Shannara? 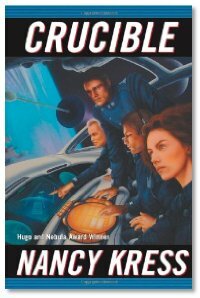 Crucible is Nancy's follow-up book (which Evo didn't know, so go ahead!) of hard science fiction, Evo's favorite! She does a great job of bringing two alien races which are quite alien... not just dudes in rubber suits. The book is an exploration of humanity, from the point of view of not only the aliens, but some pretty rotten and petty humans. Fans in an uproar over glitches on the Star Wars DVDs? LOTR:ROTK debut is Dec 14th. Stepping toward a universal translator... really! Rock, scissors, paper, Spock, lizard: the game! Darth Vader robs pizza delivery guy.